This rendering looks pretty real! Expert a slightly more aggressive stance and possibly larger wheels with lower profile tires. Under the hood, we’d expect both engine options to be available, with the 2.0T making 255-hp and 260 lb-ft of torque, while the V6 turbo delivers 365-hp and 376 lb-ft. Rumors have suggested Genesis is looking to roll out a performance trim option for the G70 sedan, and the G70 coupe could be just the excuse needed to debut it on! With the sedan stickering for $35,895 for the 2.0T model and $44,745 for the V6-turbo, expect the coupe version to cost approximately $1,000 more – plus an extra $2,000 for AWD. 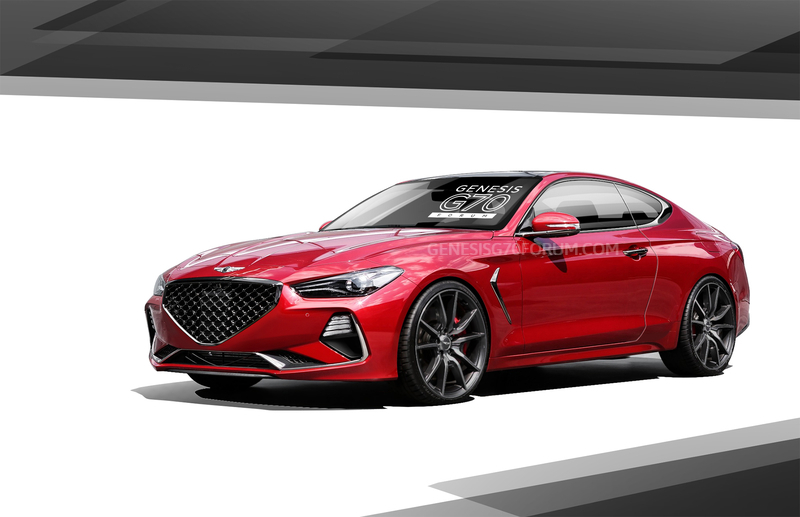 Back in 2016 a leaked future product document from Genesis revealed that the brand was planning a coupe version of the G70, which is set to arrive after the launch of the GV80 mid-size luxury SUV and right around the same time as the launch of the compact GV70 SUV. The news came at about the same time, the brand debuted the G-Coupe Concept with a swoopy design. Look for a Genesis G70 Coupe in about a year’s time. That should give the Germans long enough to get worried.